Halitosis or bad breath can really be very embarrassing and in most cases it might even result in anxiety. There can be absolutely no doubt in the fact that the shelves of different departmental stores are filled with mints, gums and mouthwashes specifically designed for fighting bad breath. However, most products in this category serve as temporary measures and they do not address the roots of the problem. Certain health conditions, habits and foods are the main causes of halitosis. Proper dental care is one of the most effective ways of improving bad breath. However, the services of a dentist might be required for serious conditions of bad breathe. There are even certain medical conditions that cause bad breath. 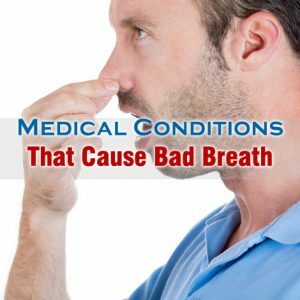 Have a look at some of the most common medical conditions that cause bad breath, which you need to be aware of. Gastrointestinal conditions can also result in bad breath. Bacterial infections of the small intestine and the stomach lining can cause bad breath. Even gastro-esophageal reflux disease can be a major cause of bad breath. Allergies are also one of the common medical conditions that cause bad breath. Bad breath might afflict people who suffer from different types of allergies. Nasal drip and mucus provide a very fertile breeding ground for germs causing bad breath. People who try to alleviate the symptoms of allergies generally experience dry mouth resulting in bad breath. People suffering from diabetes do not have adequate production of insulin resulting in the body burning fat leading to an increase of ketones. The body tries getting rid of ketones through the lungs and through urine. This results in bad breath conditions. The people who suffer from liver disease also experience musty smelling breath. It has been evaluated through studies that breath tests for liver diseases always tend to be the most effective. Fishy breath is always not the result of eating seafood. If your mouth smells fishy even if you have not taken seafood for a very long time, it might be an indication of kidney failure. Kidney failure can also result in the mouth smelling similar to ammonia or urine-like.